Chapter 14 called as the ‘Diksha Kandam’ provides you the Moola mantra prescribed in your Nadi as a remedy for your life problems. 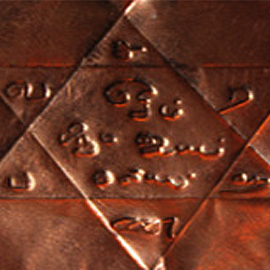 This mantra inscribed in a copper sheet (Raksha Plate) and energized for 48 days becomes your protective shield and ward off evil eyes, black magic, and negative forces. Wearing this Raksha Plate kept inside a silver or gold amulet can remove obstacles, delays, and sicknesses denying progress in life. Note: Please fill in the amount that your Nadi Coordinator informed you in person or shared with you via the email in the box provided and proceed to checkout. If you wish to be an entrepreneur or would like to have an idea about your business profit, this chapter summarizes it all. The chapter also reveals the chances of second marriage in one’s life. Nadi Essential Package includes the most important and necessary chapters in your life with the help of your thumb print. It includes readings from the chapters 1, 13 and 14.